Any statto's out there who can tell us how many times we've come from behind to win away this season? I do not expect the match pictures to come until the morning, due to having to be at a important meeting tomorrow afternoon, I'm very sorry I won't be able to put the pictures up until the early evening. Who in their right mind would have predicted match stats like this after our first half hiding. Unbelievable! But then to go away just three days later and beat 2nd place Bury at their ground for me, has to be an even bigger achievement than beating Shrewsbury five nil at home. Someone posted the other day they thought Bury would be more worried about us after we thumped Shrewsbury. I can hear the Bury manager right now just before the start of the game talking to his players. “Look lads this lot has got goals in them and if we let them near our goal they will score and win the game. Throw everything at them and try and keep them in their half and go for goal at every opportunity”. Well that’s what they did and the important thing was our players did not let their heads drop when they went behind so early in the game. Yes it seems they were struggling to get their act together at the back at times and could not get their own game going, but they hung in there and did not let Bury get a second goal. To come out in the second half after the bashing and bruising they got in the first half and to then turn the game on its head, speaks volumes about the character of our players. It also speaks volumes about the sprit in the dressing room and the fact our players played for the manager tonight and that bolds well for all our remaining games this season. Just got back as I only live 11 miles away from Bury and work there too. Be proud, be very very proud – this was an immense performance particularly in the 2nd half where we totally raised the tempo and took the game to them. We ran Bury ragged in the end with slick fast movement and interplay. Though it was not like that in the first half. After conceding potentially suicidal early goal (about the 3rd minute I think) we were really up against it and Bury showed what a good side they are. Their flank play was devastating but we stuck to it and gradually established a foothold in the game. Their goal stemmed from a Branston error in losing possession. This eventually led to their winger being provider to the prolific Lowe. But that was the only error Branston made for the rest of the game. Our first half possession was good but our goal threat non existent and though the defence had settled we needed much more penetration up front after the interval if we were ever to get back in to it. At this point of my report I have a confession to make. The Bury times were offering a cut out voucher to home fans only which provided match day admission on presentation of the voucher for £5. Well in these hard economic times and also on a point of principle I decided to be a ‘mute home fan’ and take advantage of the offer. The big disadvantage being having to show total restraint in not cheering for the lads (when I usually arrive home hoarse) and also being surrounded by the ‘enemy’. The other snag was that due to the very wide concourse between the home stand and the pitch it was almost a bird’s eye view of our attacking play in the 2nd half. I saw our goals go in but could not describe the build up very precisely due to the seeing distance involved. But make no mistake we really took the game to them. First we had an ‘equaliser’ that looked perfectly good disallowed by the linesman after first being given by the ref. Shortly afterwards the very impressive Stanley did get the equaliser from one of many slick Gulls attacks. It was also very fitting that the outstanding Zebroski bagged the winner with what appeared to be a fine header. Zebs workrate was inspirational to his team mates, as was Stanley’s with Nico providing constant ammo with his excellent throw ins, corners and free kicks. Robinson also played a big part with his intelligent running off the ball and creation of space for others. The whole team played well. This must be the finest crop of loanees we have acquired in a long while and they have very quickly adopted the buckle work ethic. Tomlin looked rather lightweight in the first half but he, too, stuck at it and made a valuable contribution in the 2nd half. Bury are a very good side and will surely go up automatically but in the end they were lucky to have only lost 2 -1. In the 10 years i have been living up north I have seen us play many times at Bury and we seem to have become a bit of a bogie team on their patch. Last year we produced a stunning 3 – 0 win to dent their play off hopes in the penultimate game. Tonight this was even more impressive especially with conceding that early goal and with them being rampant for a good 25 minutesc after that! We also showed that our young team are learning fast and we played out time intelligently by going for the corners in the last 10 minutes. The bury fans were leaving in droves with 5 minutes left. Play offs here we come! Well, that was the "game of two halves" to end all games of..... First half we played like Brixham Villa second like Brazil ! I thought I might need the prog to check some unfamiliar Gulls faces but it listed in our squad Charnock, Benyon, Wroe, Carlisle, Gritts, Rose, Hemmings and Senda, so no point looking for Pringle etc ! I noticed our forwards warming up by firing shot after shot in at Potter. Then we started in what I can only imagine was Aldershot performance style i.e. bad. 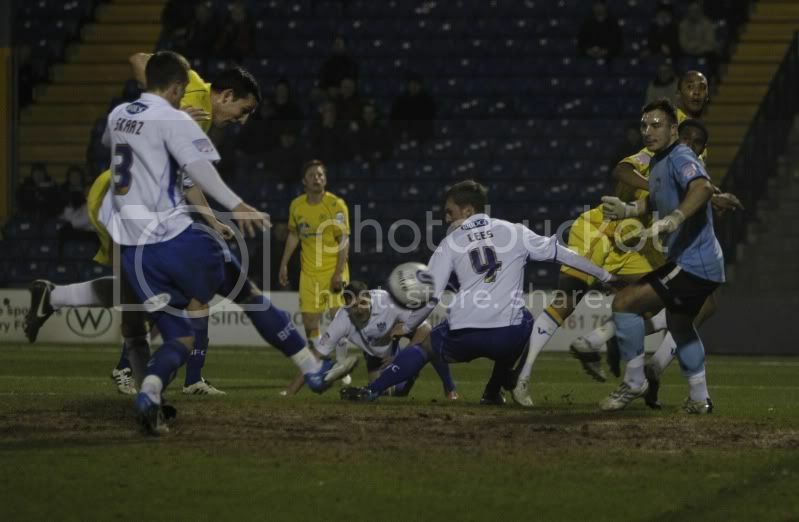 Bury were really up for it and we couldn't keep the ball. Branners dribbled out of defence, got into trouble, the ball was switched wide left, low ball in and it's in the net. Manse got robbed, great save from Bev. 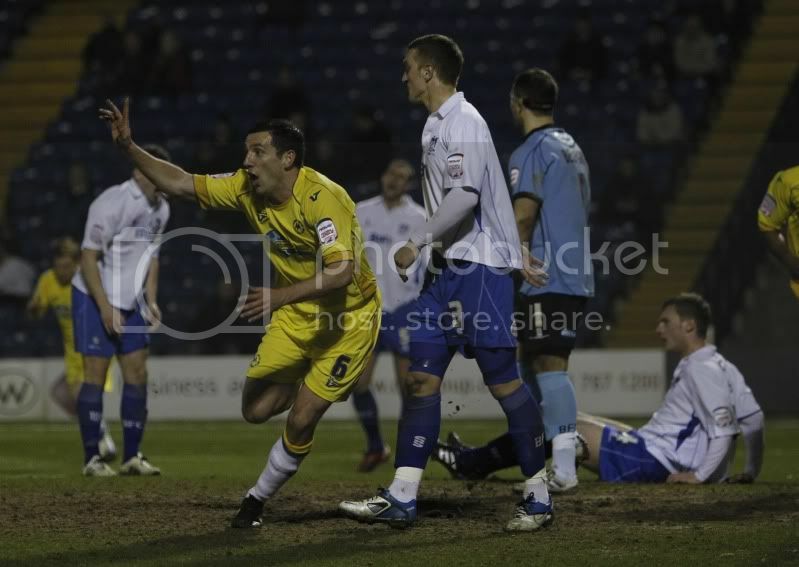 Every time Bury seemed to give us a sniff of the ball we gave it back to them or they were too quick for us. Bev made another great save, finger-tipping the ball onto the post. 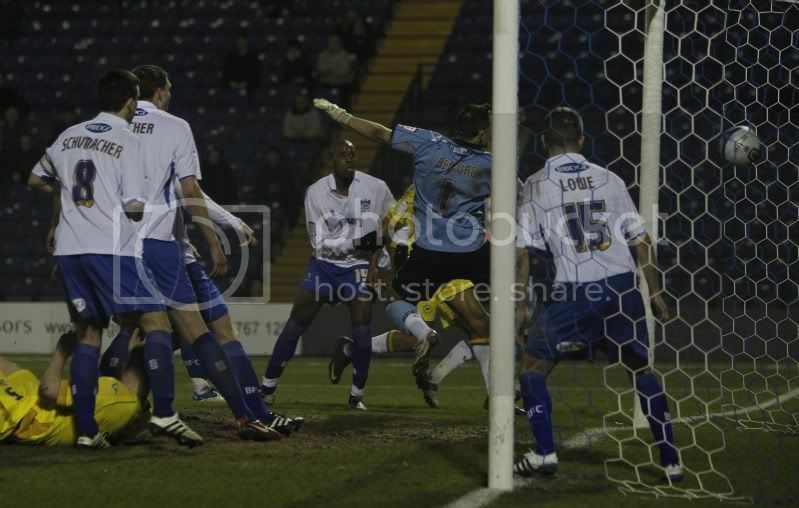 Another save from the big man and Bury fired wide froma good position. We were outfought in midfield and Bury's wide men were quick and dangerous. After one neat passing move from Utd the Bury winger waltzed through our defence only to baloon it over. Big dangerman Lowe was then clean through but fell over his own feet with a goal beckoning and the ball ran dead. After 35 mins Murray was subbed by Lathrope, presumably to shore up midfield, tho there might have been a knock. Anyway we were back to one up front. Again Bury crossed the ball into the box and their forward had time to control the ball, turn before firing over. On 45 mins Zebs had atame shot - was it our first ? HT and incredibly only 1-0, thanks to Bev. I reckon about 50 Gulls fans as the second half started. Couldn't see us getting much joy in the air with the giant Furcher at CH for them. Anyway, we started the second half much the same, not able to keep possession and Bury quicker. Then things suddenly changed, search me why ! Robinson had a decent shot from outside the box which the keeper parried to Zebs, who scored only to be flagged offside. United then upped svereal gears and, after a great move Pringle crossed from the left and three Gulls were lining up to score but it was Stanley who knocked it in from close range. United were now taking Bury, who looked really Shaken, apart. Two corners, keeper saves from Zebs, Tomlin shoots straight at him. In a rare Bury break we let their winger run and he produced a cross from which Bev saved a rather tame header. Robinson was then clearly held right on the edge of their box and Nico's free kick ballooned over off the wall. From the corner Zebs headed in at the far post. We hardly gave Bury a look in for the rest of the game - an amazing turn-round. The Gulls fans kept up a good level of noise in the 2nd half. I thought the defence recovered well and did well in the second half, particularly Branners, Robertson and Nico. Stanley was excellent in midfield, all over the pitch in fact - gutted that we haven't got him till the end. Didn't notice Lathrope too much, tho he probably did help to tighten things up. Was impressed with Pringle, who worked well down the left. 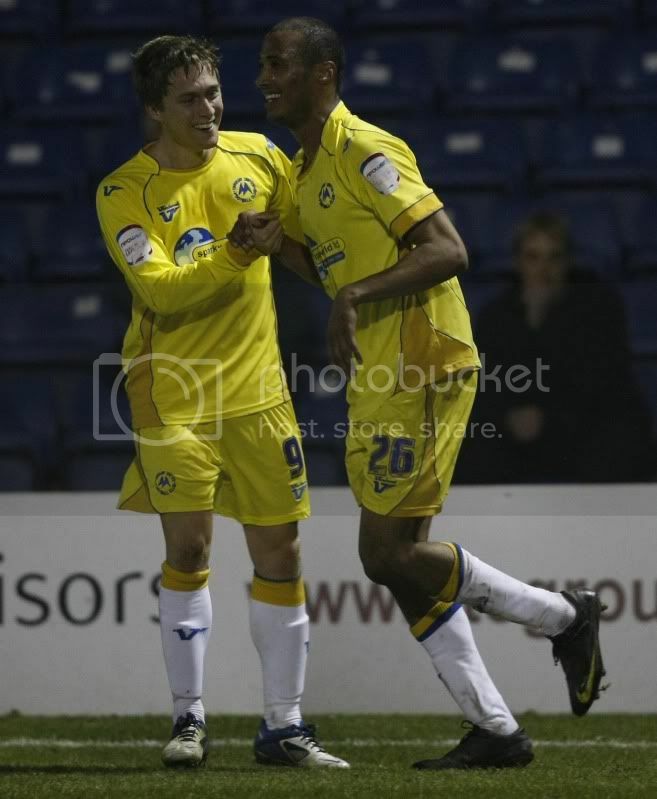 I quite liked Tomlin too, after a shaky start. He held the ball up well, was quite tricky, looked for a shot and worked hard. Robinson started well, mostly cutting in from the left onto his right foot but he faded to an extent although was still involved in key moments. Zebs was great, never stopped running and caused them problems. Sorry that's a bit long-winded but it was some game. Roll on Macc - but who knows which United will turn up ! Great result. When we have 3 points deducted we will still be in there with a great chance. By the way a few people complained about the Gulls player. I used it to listen to the full 90 minutes so maybe the problem is elsewhere. Thought your second half performance was the best we have seen all season. We battered you in the first half and could have gone in 3 or 4 goals up, but fair play to your Manager. He saw what was wrong, changed your formation, and the game changed round completely. I was impressed with your team last season when you beat us 3-0 up here, but last night you passed the ball around quickly, and dominated the second half so much, that I came away thankful it was only 2-1. Good luck for the rest of the season. I can see you sneaking into the top 5 or even better if you continue like that. 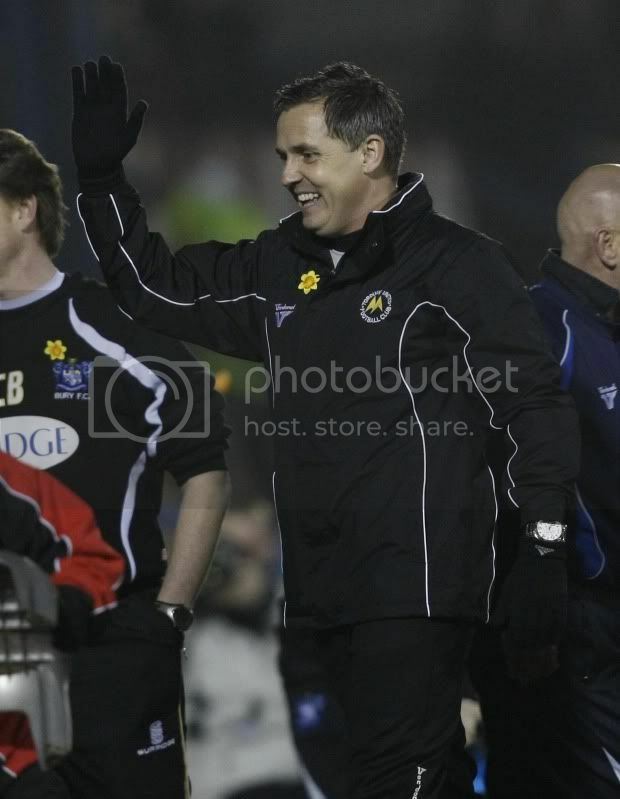 Hi Buryfan and welcome to the TFF. Not at the game myself only listened to it on the radio. You sure battered us in the first half and maybe should have gone in at halftime three nil up. Does sound like we played much better in the second half and when we do play like that, we are a match for any team. But we have lacked the necessary consistency in our performances recently and it has cost us dropped points in games we were winning. Good luck for the rest of the season and here's hoping we play you next season in division one.